These easy old-fashioned scalloped tomatoes make a fabulous side dish. Use plain dry bread crumbs in the recipe. I cut up a few slices of rustic homemade bread, dried them for about 10 minutes in a 350 F oven, then processed them in the food processor to make fine crumbs. Also, I didn't want the tomatoes to be overly sweet, so I reduced the brown sugar to 3 tablespoons. I added about 1/4 teaspoon of celery salt as well. See some additional variations below. Butter a shallow 1 1/2-quart casserole. Melt the butter in a medium saucepan over medium heat. Add the chopped onion and saute until they are translucent. Add the bread crumbs and brown sugar. Cook, stirring, until well blended and hot. Add the tomatoes, salt, and pepper. Heat through. 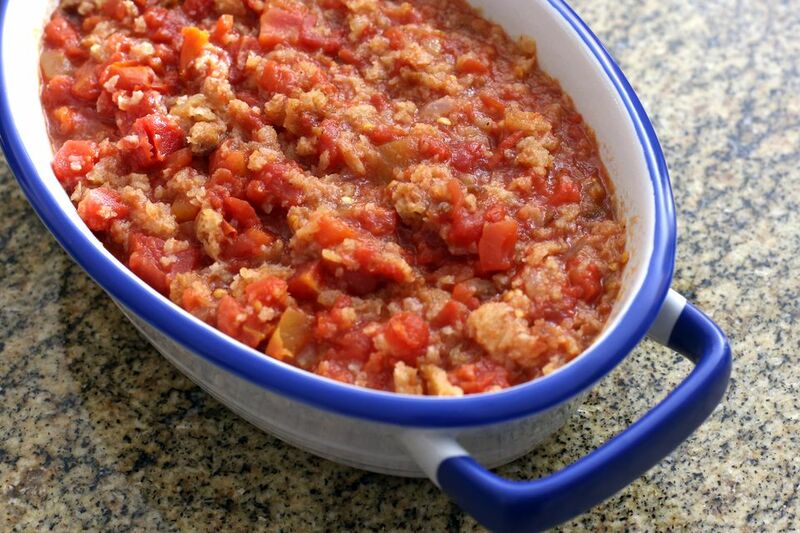 Turn the tomato mixture into the prepared baking dish. Add 1/4 to 1/2 teaspoon of celery salt or saute 1/4 cup of chopped celery with the onion. Savory Scalloped Tomatoes: Reduce the sugar to 1 tablespoon and add 1 teaspoon of garlic powder or 2 cloves of garlic, minced, along with 1/4 cup of chopped fresh basil leaves. Top the casserole with about 1/2 cup of grated Parmesan cheese. Bake as directed.